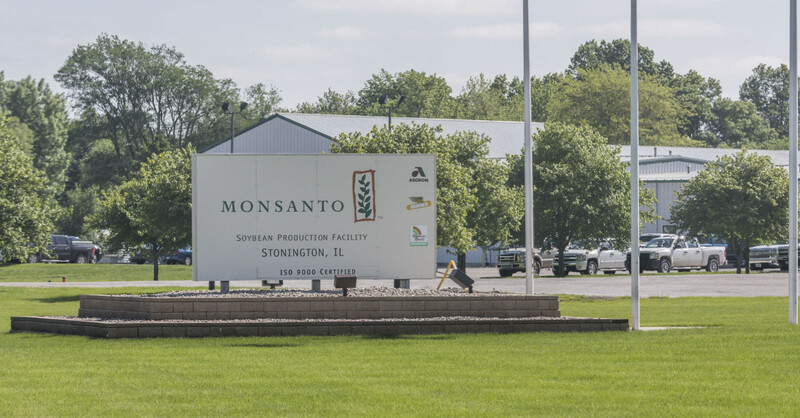 A Monsanto facility in Stonington, Ill., on May 19, 2015. As the U.S. Environmental Protection Agency prepared to make label changes for the herbicide dicamba after it caused widespread crop damage, the agency depended on the herbicide’s maker for guidance, documents produced in a federal lawsuit show. A review of more than 800 pages of documents from a lawsuit filed against the U.S. EPA in January 2017 highlight the process behind how the agency made the label changes. The lawsuit was filed by the Center for Food Safety, the Center for Biological Diversity, the National Family Farm Coalition and the Pesticide Action Network North America in the U.S. Court of Appeals for the 9th Circuit. The lawsuit alleges the agency unlawfully approved a version of dicamba made by Monsanto. It spent a year in discovery before plaintiffs’ filed a brief in February outlining their argument. Oral arguments are scheduled August 29 in Seattle, Washington. “Like I said, no surprises,” wrote Reuben Baris, acting chief of the Herbicide Branch of the EPA’s Office of Pesticide Programs, to Thomas Marvin, a Monsanto lawyer, hours before the new label was announced, according to an email dated October 10 obtained in the lawsuit. The email came during a week of exchanges between the EPA and agribusiness Monsanto in 2017 about the terms and conditions that Monsanto would have to agree to for the label change. Monsanto is an intervenor in the case, meaning it joined the case to help defend the registration. Dicamba is a traditional herbicide that has been used on corn and other crops, and the EPA approved its use for genetically modified soybeans and cotton crops in late 2016. Monsanto had touted the new dicamba-resistant soybean and cotton seeds as its biggest biotech launch in company history. The company also made its own version of dicamba, touted to be less volatile. But in 2017, the herbicide damaged more than 3.6 million acres of soybeans and other crops in 25 states, according to expert estimates. Dozens of farmers have sued Monsanto over the damage and loss in crop revenue. In October, the EPA restricted the use of dicamba, making it a restricted use pesticide and limiting the conditions under which it could be applied. But while making the changes, the EPA ignored state officials’ recommendations, did not use any new data or analysis to back up its new restrictions and allowed the herbicide’s maker to dictate the label’s terms and conditions, according to documents filed in the suit. This year, despite the new changes, more than one million acres of soybeans are estimated to have been damaged by dicamba as of July 15, according to Kevin Bradley, a University of Missouri weed scientist. A pesticide applicator sprays soybeans in rural McLean County in Illinois on July 26, 2017. In June, pharmaceutical giant Bayer bought Monsanto for more than $60 billion. The transition is expected to take two months, after which Bayer will drop Monsanto's name. Until then, Monsanto continues to operate as an independent company, according to a company news release. In response to comment for this story, Monsanto spokeswoman Lord pointed out the benefits that farmers got from dicamba, saying that 97 percent of customers were satisfied and had a 5.7 bushel per acre advantage over other soybeans in its field trials. BASF, which makes another version of the herbicide, is not a party to the case but its version of dicamba is covered under a “me-too” approval, meaning that the pesticide is similar or identical in its uses or formulations. In a response filed in April, the agency said it followed all regular procedures in approving the new registration of the herbicide, as well in changes to the label following widespread damage. The EPA said the label change process was “the most environmentally responsible and protective approach that could be implemented in time for the 2018 growing season. “EPA’s approval of the 2017 Amended Label was a careful but swift response to complaints about off-field movement,” the agency wrote in its response. Additionally, Monsanto, which has the lead registration with the EPA and created the new seeds, continued to influence changes to the label, even after the herbicide led to a record number of pesticide misuse complaints in 2017, documents show. Documents from the lawsuit include email communications between government officials and Monsanto officials, news reports, scientific studies and draft documents of proposed registration. In one exchange, Monsanto stated what changes it found acceptable, and even attached a word document, crossing out sections it did not agree to. “We accepted a number of the proposed changes, but did not incorporate all the iterative communications with retailers proposed in the last draft. In particular, we are concerned that those iterative communications might require a potentially significant period of time to complete,” wrote Philip Perry, a lawyer for Monsanto, to the EPA, in an October 10 email. In its April response, the EPA said that Monsanto’s changes were the best approach to take before the new growing season. In November 2016, the EPA approved Monsanto’s version of dicamba for a two-year trial period. The February brief also alleges that the EPA violated the Endangered Species Act by overstepping its bounds and approving the herbicide without letting the wildlife agencies determine whether dicamba would have an impact on species protected by the act. The pesticide law requires companies to conduct research about pesticides in order to save taxpayers money, though the company paying for the research also raises questions about the validity of the research, said George Kimbrell, a lawyer for the Center for Food Safety. Additionally, the EPA did not incorporate “any new data or analysis” in changing the label, instead relying on the data from November 2016, despite a year of the pesticide being used in the field, according to the February brief. Between August and September 2017, EPA officials met with Monsanto four times, according to the lawsuit. On an August 23 call with state officials, the EPA said it was discussing label changes for dicamba with Monsanto, BASF and DuPont, which has a registration for a branded version of Monsanto’s dicamba. 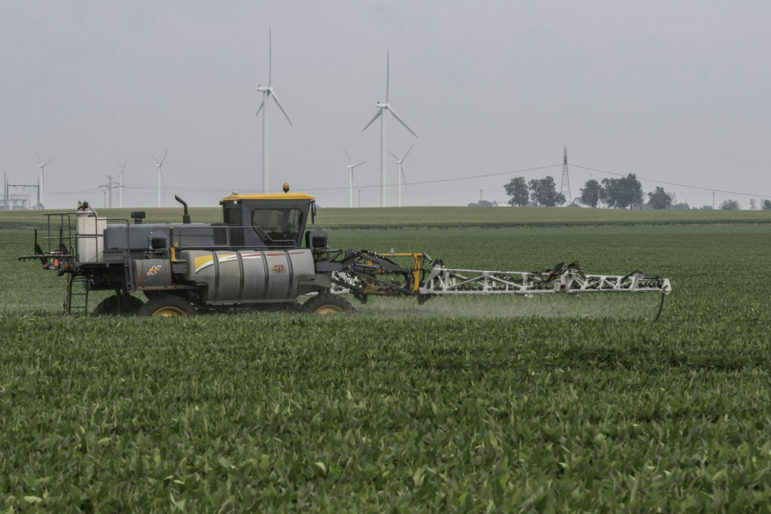 EPA officials said the agency was considering changing wind speed and tractor speed, limiting the timing of application, requiring more training and classifying the product as restricted use, which requires applicators to be registered and more keep records about application. During the call, state officials warned the EPA that the proposed label changes only addressed physical drift and not volatility, which caused many of the issues, according to meeting notes. Jason Norsworthy, a weed scientist at the University of Arkansas, said “there’s nothing we can do for a volatile product as far as label changes,” notes show. “Acreage is going to be much higher in 2018, and these solutions won’t address that,” he said. Several other officials then said that a cutoff date to limit when the herbicide could be sprayed could be effective, although soybean planting dates in the South are much earlier than in farther north areas. Monsanto opposed the cutoff date, according to its comments to multiple news agencies. In October 2017, the EPA imposed restrictions on the herbicide for 2018, although officials did not implement a cutoff date. However, Arkansas imposed a cutoff date of April 15 for the spraying of dicamba. Additionally, several other states imposed restrictions on top of the EPA’s label changes. The EPA also wrote that it considered the benefits of dicamba to farmers. “Further, Petitioners unreasonably downplay the benefits of these new uses. Herbicides like Xtendimax are an important element of modern agriculture, and EPA recognized that Xtendimax could offer advantages over other registered pesticides, particularly the ability to apply it throughout the growing season to combat new flushes of weeds,” the EPA wrote.